Caleb Lindhorst sometimes uses a motorized chair to get around. 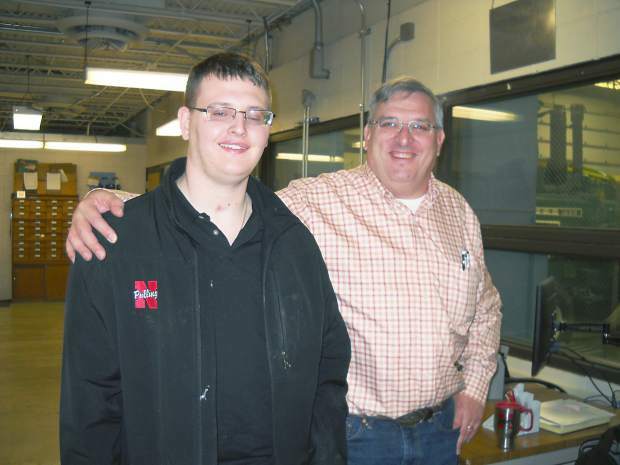 Caleb Lindhorst worked his way back to classes at UNL with help from his academic advisor, Roger Hoy. Caleb Lindhorst of Lindsay, Neb., is captain of the UNL Quarter Scale Tractor Team. Don't tell Caleb Lindhorst he can't do something. That's the quickest way to light a fire that fuels the single-minded determination and grit needed to do the impossible. 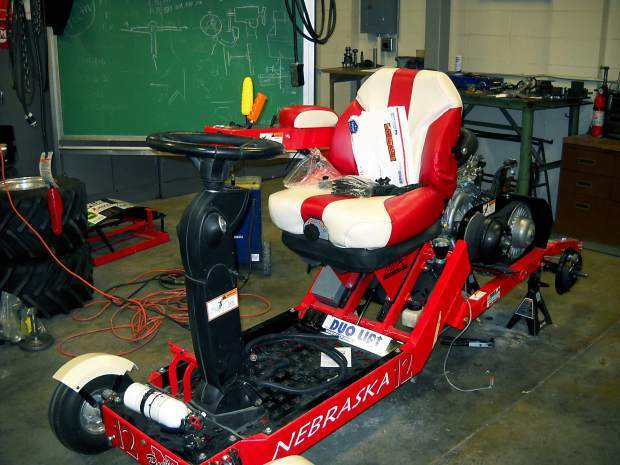 This semester at the University of Nebraska-Lincoln, the junior agricultural engineering major is leading a design team in a national competition. He has also set his sights on earning a perfect 4.0 average in his classes. When those goals are accomplished, Lindhorst wants to deliver the news personally to the rehabilitation therapist who told Caleb he would not be able to handle college-level work as a result of injuries he suffered in a serious car accident. Don't bet against Caleb Lindhorst. No doubt, Lindhorst faces challenges from his life-threatening injuries. He moves haltingly, with help from a small walker. He also uses a motorized chair to get around. He deals with loss of movement in his left hand and arm and he has speech deficits. But Lindhorst has come a long way. “This is the path of life and you have to know how to pass through it. I think I’m doing okay with that. The accident happened just before Christmas 2013 on a gravel road near his hometown of Lindsay, Neb. The then 20-year-old student sitting in back was leaning forward to talk to the two people in the front seat when the driver lost control. The car slid into a ditch and rolled over and Lindhorst was thrown from the vehicle. He was taken to a hospital in Columbus, Neb., and then airlifted to the University of Nebraska Medical Center in Omaha. The prognosis was not good because Lindhorst's brain stem had twisted in the accident, causing traumatic brain injury. He slipped into a coma and it was not clear what condition he would be in if and when he woke up. Doctors told Lindhorst's parents their son had only a 10 percent chance of coming out of the coma. After 39 days, he was awake and ready to get to work rebuilding the damaged neural pathways in his brain. At Madonna Rehabilitation Hospital in Lincoln, Lindhorst began the journey to recovery, re-learning to walk and talk. After two months at Madonna, he would move to another facility in Omaha, where one of the rehab therapists made a big mistake. "He told me I wouldn't be able to go back to college," Lindhorst said. "That was what frustrated me the most, is people thinking I was dumb. I knew there wasn't anything wrong with me mentally." And so did his academic advisor, Roger Hoy, a UNL professor of biological systems engineering and director of the Nebraska Tractor Test Laboratory. 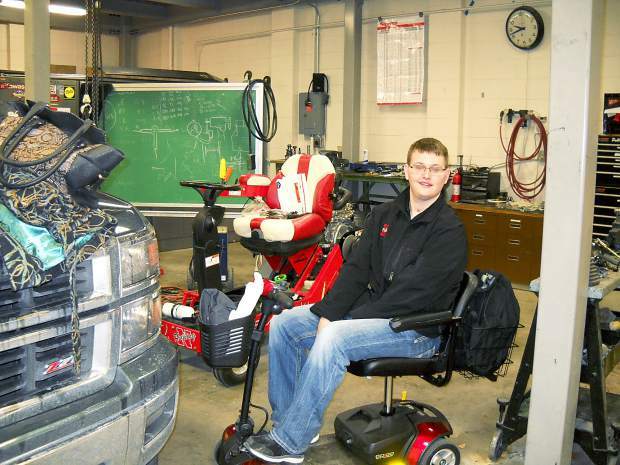 Before the accident, Lindhorst worked for Hoy at the Tractor Test Lab and was a good student. When Hoy went to visit Lindhorst, the first thing the student said was that he wanted to attend an engineering design competition with the UNL team last May. "I knew right then there was nothing wrong between the ears," Hoy said. Lindhorst did attend the competition with his father and a year later, he is part of the team. It was a long road back for Lindhorst and at first, it was not clear how well he would handle a return to academic life. When Lindhorst was in Omaha, Hoy traveled there once or twice a week to teach the student material from a fundamental engineering class. It was slow going at first but by the time Lindhorst took his final exam, he had proved he could understand the material. Hoy said he felt bad about giving Lindhorst a final exam and even offered to help him with the one of the complex problems. Instead Hoy got a text from Lindhorst: "I don't need any help." He did well on the final. Now, Lindhorst is back in school, taking his agricultural engineering classes and leading the 2015 UNL team that will compete in the International ¼ Scale Tractor Student Design Competition. The competition held in May in Peoria, Ill., is sponsored by the American Society of Agricultural and Biological Engineers, with support from industry partners like John Deere and Caterpillar. Student teams are given an engine and two tires. The students design and build the small-scale tractor, submit a written design report and give a presentation to industry experts. The tractor is judged on factors including innovation, ease of manufacturing, serviceability, maneuverability, ergonomics and sound level. Performance is tested during a tractor pull event. Lindhorst said he is getting valuable experience with the entire design process and putting into practice the material he has learned in the classroom. The competition also allows students to develop skills in teamwork, leadership and communication. "As a result of being a team captain, Caleb will get the equivalent of two years of work experience," Hoy said. "That's why industry partners like John Deere sponsor the competition." Hoy believes Lindhorst's strong work ethic, self-discipline and patience helped him get back to where he is today. Family support from Lindhorst's parents has never waivered and the rural Nebraska spirit kicked into high gear to help the family through a tough time. 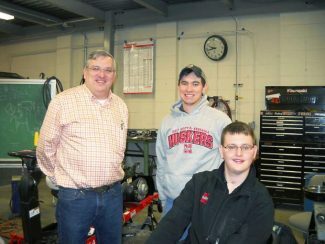 Hoy said his students and faculty at UNL, along with fellow employees at the Tractor Test Lab, never gave in to despair. "He was one of us. When he got hurt, I knew we needed a miracle. We got one," Hoy said. Lindhorst credits his strong faith in God and the prayers of many Nebraskans for his recovery. "After the accident, the entire town moved to UNMC. There were 200 people there. That's what I love about a small town," Lindhorst said. "Friends who came and visited me would cry because I remembered their names." It will be another year before Lindhorst regains full physical health, and perhaps even more years until his brain heals. But Lindhorst isn't waiting for anything. When he graduates, he plans to go wherever life takes him. And he has learned a lot from his experience. "This is the path of life and you have to know how to pass through it," Lindhorst said. "I think I'm doing okay with that."